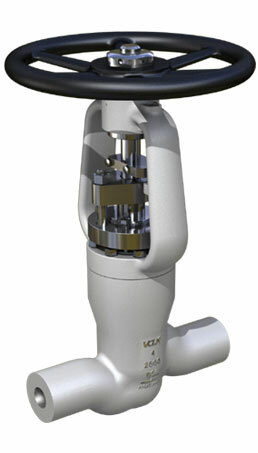 All VOLK globe valves use a body guided disc which is held concentric at all times with the body seat. Guiding is done over the full length of the disc to provide a valve with a fully guided disc. Bonnet: With cooling chamber, it increases the packing life and sealability by maintaining packing at normal temperature. The eyebolt type gland bolt makes repacking easy. Renewable and easy to replace seat ring are seal welded to minimize distortion from body stress. Hardfaced seat ensures long service life, better resistance to heat, corrosion and erosion. Yoke: Two arms design for rigidity and accessibility. Stem: Smooth finish ensures seal and smooth operation; stem thread is precision machined to provide toughness and increased durability. Expanded graphite seal ring: Excellent seal performance at low and high pressure, even under severe pressure and temperature transients.